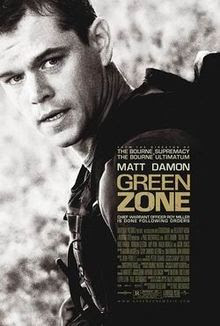 Set almost directly after the US invaded Iraq in the search of WMDs in 2003, Green Zone follows Military Chief Roy Miller (Matt Damon) as he leads his squad through an anarchic Middle East environment heroically looking for said weapons. Constantly coming up with “a donut” at the end of his missions, he becomes increasingly suspicious of how the intelligence he is receiving is leading him to dead ends. With the help of a paranoid Iraq citizen, a CIA agent (Brendan Gleeson) and a strong desire to make a difference in the face of war, he takes on a risky path to the truth. Despite the talent behind it, on the surface, Green Zone still sounds a bit clichéd. A potentially harsh call as it aims to be an action film first, and serious political commentary second. So yes, we still have a slightly predictable “bad guy” and plot development, but they are clichés this type of film cannot exist without, where they ultimately sit, barely noticeable, in a very mature-minded film. Damon - through a stellar script, takes control of his character, and dominates his (almost permanent) time on screen. He does feel familiar given the previous collaborations between director and star, but regardless, it is a convincing and dramatic performance. Support from Gleeson and Greg Kinnear, as US Admin puppet, Clark Poundstone, is particularly good. Serving as Miller’s contact/interpreter “Freddy”, Khalid Abdalla, is a honest portrayal of a desperate Iraqi as one could hope for from Hollywood. The movies true strength is mainly derived from Brian Helgeland’s very intelligent script, which most rewarding of all, feels authentic. Dialogue is razor sharp and, as expected, all very “military“. Not in the sense of technical jargon, but more that its delivery and the actual words feel just right. Obviously crucial when dealing with real world settings like here. In its typical Greengrass style, the film is full throttle, the score used to great effect alongside some of the jaw-dropping editing. With this film, you are in; two hours later you are out - left to deal with the sensory overload. The fat trimmed to the point that no scene feels pointless, the story constantly moving forward via video game velocity. The epic foot chase finale is as bewildering as it is intense. Greengrass’ forte is at the hilt with it. The manic, handheld style of the director alienates many, but it can be argued that to match the intensity of such situations, it is the best approach. Given it has virtually taken over the contemporary action genre as well, trying to embrace it can still go both ways. Nevertheless, and much as previous films made about Vietnam for example, a political stance begs to be made. Similar to The Bourne Supremacy (another Damon/Greengrass collaboration), and against the usual Hollywood approach, the director allows the action to simmer off at the end, leaving poignancy to finish the film. Green Zone’s statement is hardly subtle, and won’t impress supporters of the war depicted on screen, but overall, it is an action film primarily aiming to entertain. This it does, proving to be one of the best contemporary efforts in recent years.